Our fellow Texan, Ryan Zeller, joined the promotions team in 2017 and is our top performing promoter. He works closely with the rest of the team to provide teams with customized cheer music, camps, and clinics. 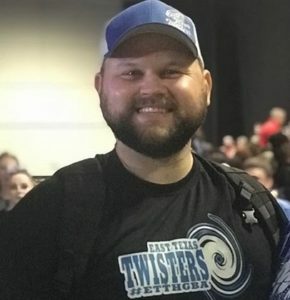 Ryan can often be found promoting Cheer Music Factory at cheer competitions, while he also coaches his East Texas Twisters. Ryan is noted for his passion for the sport and also the CMF brand. We are very fortunate to have him!